My 2015 Prius Travels is what is called "Living in and Out of the Prius". I modified my 2011 Prius by removing the rear seats and replacing them with a design I created out of 1/2" plywood to provide sleeping, storage, and seating are in the back seat. This plywood, paint, and hardware didn't cost that much. I never totaled all the items I purchased to make my Prius my home for 3.5 months. The most expensive items I purchased were my sleeping bag, mattress pad, cooking items, true sine wave inverter, multi chemistry battery charger, high-tech folding table, high-tech folding chair and many miscellaneous items. These items did cost hundreds of dollars. They were all necessary to make my trip comfortable but are not included in this blog's travel costs. Possibly I may try to resurrect this upfront costs in another blog. 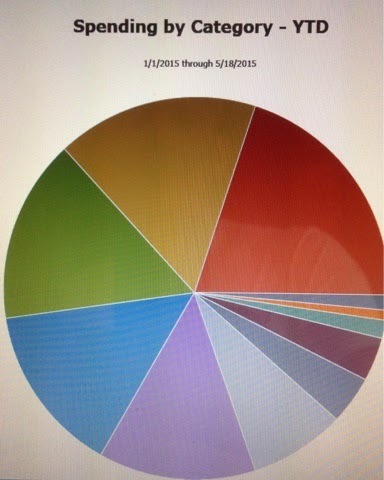 Here is how the pie chart breaks down by percentage. 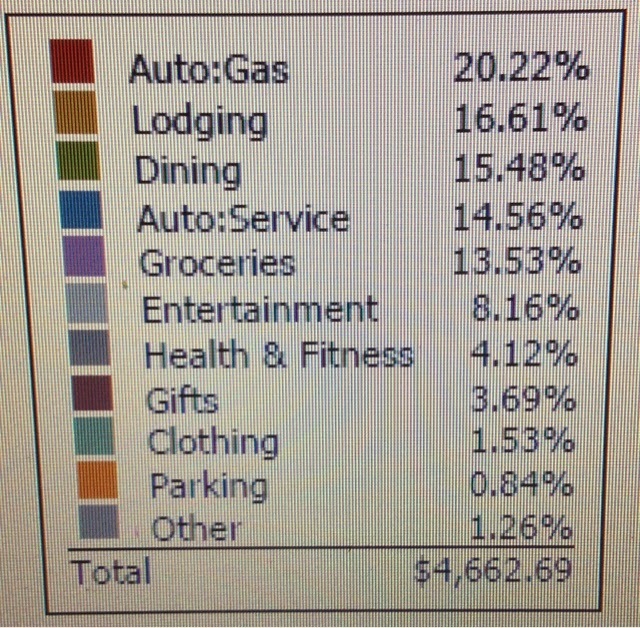 Here is the breakdown by cost. I spent about $8,800 for my 2014 Travels in my Class B Campervan, so I I am just over half this year in my Prius Campervan than last year. I will do a more detailed comparison in another blog posting. The exceptional news was that it cost me less than $1,000 for gas to go 19,450 milestone my travels this year. If I didn't hit the curb and had to buy 2 new tires and have a front end alignment I would have been below half of last year. It does point out that wear on the vehicle is a cost as the two other tires that were not replaced in Tucson are ready to be replaced now. I bought the 2011 Prius used last July with 8,000+ miles on it and it now has 36,000 miles. Dining at $721.00 also included me buying some meals when i was visiting my son's on the west and east coast but this made up for not buying groceries when I stayed with them. Entertainment included going mostly to movies, parks and museums. Lodging is high by the 4 days I stayed in a hotel in Salt Lake City when meeting son Clsyton and family while they were skiing at Park City Utah. These 4 days was about $300.00 that I could have stealthed somewhere in the area. Health and fitness was mostly going to truck stops for $12.00 showers. Gifts at $172.00 were for family. As it stands at $4662.69 for 36 states and 19,450 miles traveling 105 days. I spent less than my goal of $50 per day at $44.46 per day. This did include staying with my son's for about 3 weeks and my cousin for a couple days. I never tracked the costs to the goal until I calculated my costs for the blog. 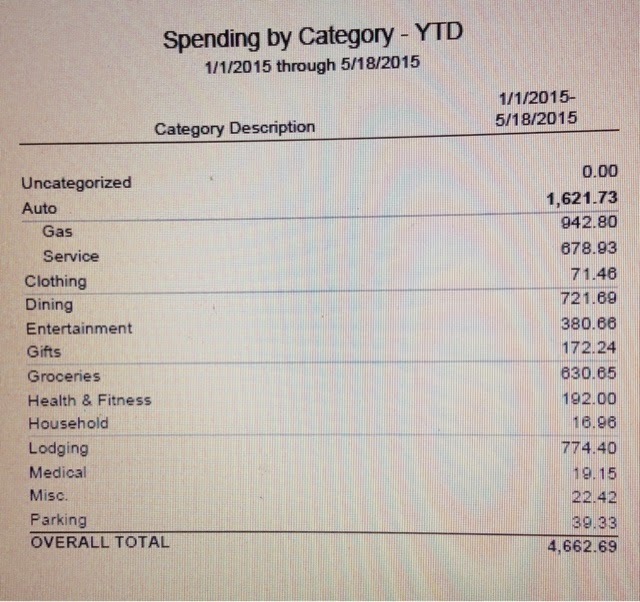 One of the popular questions asked on Vandweller blog's is what is your budget for traveling. I am thrilled with the results. It's hard to beat this and do as much as I did.